At first glance of Bonavita BV1800SS, the coffee maker looks much like an auto-drip machine that you typically see in department stores, but there’s a lot more to this model that meets the eye. In the last few years, the brand has gained immense popularity in coffee brewers due to the perfect output it delivers. It can be found in many homes and offices and people are happy about it. It does costs lesser than other few top competitors in drip coffee maker category. 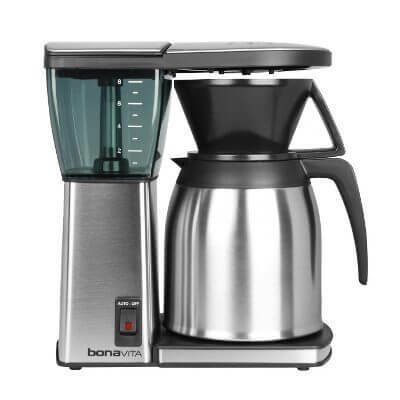 The Bonavita brews coffee that is comparable in quality to the Technivorm Moccamaster and the Oxo Barista Brain. The Bonavita BV1800SS may have a less striking design, but it takes up much less space and also costs a lot less! The company previously had 2 models were one had glass carousal and the other had thermal. Here we’ll be talking about the latter model as the one with glass is now discontinued. This coffee maker does not have the dramatic space-age design of machines such as the Moccamaster, but it does have a sleek, brushed stainless steel body and carafe. The Bonavita BV1800SS is only about 12 inches tall, making it a great option. So, if you have a limit on clearance above your counter-top, it’s a perfect buy. This machine has no fancy LED displays, clocks or bright lights. If you’ve had enough of appliances that look like they’re putting on laser shows, you might actually view this as an advantage. 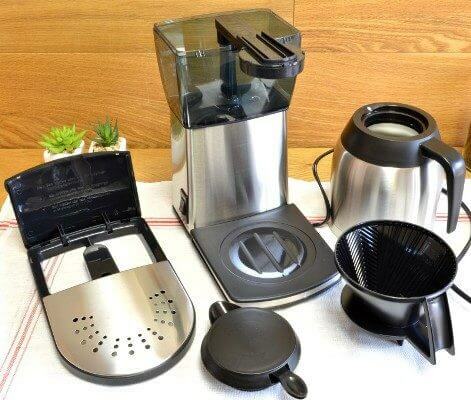 The Bonavita is designed to do one thing only – brew excellent coffee – in every perfect way. All of the engineering has gone into heating water to the optimal temperature, delivering it to the grounds via a broad shower-head, and keeping it hot in a thermal carafe long enough for you to enjoy it. The design includes a 1400-watt heater to maintain the optimal brewing temperature of around 198 to 205 degrees Fahrenheit. 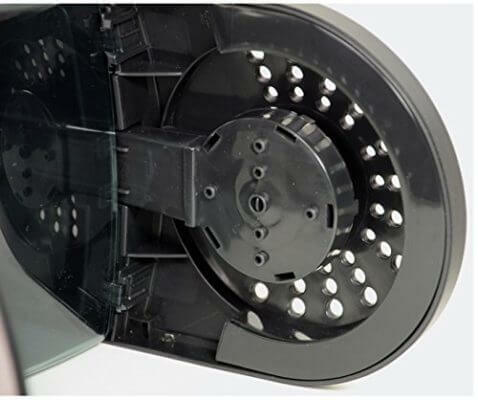 To keep the machine affordable, the designers have dispensed with every detail that does not contribute directly to the quality of the final product. The filter basket simply sits on top of the carafe during brewing. And also without getting stick in any way to the main body of the machine. There is no brew-through lid, just a separate carafe lid that you use once the coffee is finished brewing. This arrangement may feel a bit awkward as there is no obvious place to put the basket after brewing. There’s also no place to put the carafe lid anywhere on the machine when you’re not using it. You can’t program the Bonavita to make coffee while you are sleeping; you just have to push the brew button yourself in the morning. Fortunately, it only takes a few minutes to brew an entire pot. You can easily fill the water reservoir and add ground coffee to filter before you go to bed if you’re trying to streamline your morning routine. One reviewer pointed out an interesting advantage of this design: because the basket sits directly on top of the carafe, you can also use it for manual pour-over brewing. All of the Bonavita’s removable parts are dishwasher-safe. This includes the carafe lid, the showerhead and the filter basket. The carafe itself is not dishwasher-safe, but it is easy to clean just by hand washing. Like all auto-drip machines, this one will also need descaling from time to time. There is no water filter inside the tank, but using your own filter water will cut down on how much mineral build-up accumulates in your coffee maker. The Bonavita BV1800SS is designed to appeal to people who are more interested in the quality of their brew than in having lots of bells and whistles. If you grind your coffee right before brewing, the fact that there is no programmable option isn’t going to be a disadvantage for you. Also, leaving ground coffee out overnight in a filter is not the best way to wake up to great coffee! Maybe you love the design of the Moccamaster but can’t justify spending that much money on a coffee maker. The Bonavita brewer makes coffee that is excellent in quality, and the brewer rather costs less than half as much. The Bonavita BV1800SS is high-quality and reliable auto drip coffee brewer that delivers where it counts. If you value simplicity and quality, you are going to be very happy with this model.